Every year thousands of high school graduates pick Drexel University as the next step in their education. Freshman year is a very busy adjustment period when students must adapt to the new lifestyle. It is a time that includes a lot fun, but also a lot of stress. Choosing where to live your freshman year at Drexel University should not be one of the factors causes stress. That is why this blog was created. The purpose of this blog is to give incoming freshman honest ratings and feedback about the resident halls at Drexel University. It aims to provide incoming students with knowledge so that they can make educated decisions about where they want to live. Calhoun hall is one of the prominent buildings in Drexel campus. With its unique arch-shape and the huge size its truly is a site to behold. 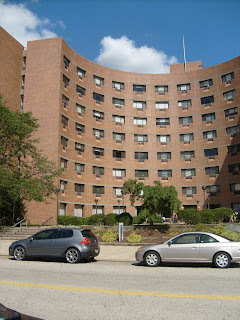 However unlike its architectural beauty and stunning front layout, residence life at Calhoun is quite unpleasant. I have only been to Calhoun a few times, however those few trips and some conversation with a few friends of mine who live there was enough to tell me what the dorm is really like. 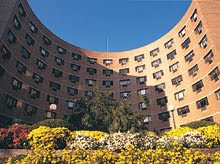 Calhoun is part of the four traditional dorms that Drexel offers. 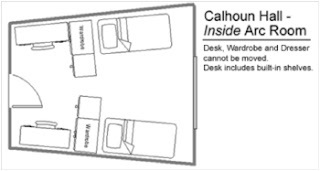 Like the other dorms in the group, Calhoun also has two students per room with an RA on each floor. However unlike the other dorms in the group, with the exception of Myers, Calhoun has both boys and girls on the same floor but on separate wings. The unique arch-shape of Calhoun creates two wings across the arch with the elevators running at the centre of the building. Both the wings have their own kitchen, laundry rooms and communal bathrooms. The kitchen, laundry room and the communal bathroom are the same as discussed in the blog-post of Kelly hall. However unlike Kelly hall the bathroom is always quite dirty with a host of problems that begin at clogged showers and overflowing toilets but do not end there. A resident of Calhoun, who has spoken to me on condition of anonymity, has stated that he usually uses the bathroom in buildings where he has classes rather than the bathroom at his dorm because the bathroom there is so dirty (quote). Also unlike all the other dorms, the furniture in the rooms at Calhoun are bolted in place and cannot be rearranged according to one’s will. This sometimes distresses students who prefer to arrange and organize their rooms in their own way. Another student, on the condition of anonymity, has stated how because she cannot arrange her desk and her living space to way she was used to at home, she has a tough time concentrating on her studies when she tries to study in her room (quote). All said and done, Calhoun is considered to be the chilliest dorm at Drexel. It is the “happening” dorm at Drexel. With co-ed floors and lax rules the party and noise is always on. So if you are one of those serious kind, looking for some peace and quiet to hit the books, then stay clear of Calhoun since this hall has a reputation for party and a high drop-out rate. The front desk staff at Calhoun, like any other residence hall at Drexel, is friendly, helpful and courteous. They are staffed 24-7 to help its residents and provide security to the building. Like other halls, you will require to either scan in to Calhoun or sign-in any other non-resident student. However Calhoun sort of makes up for all its lacking with its location. It is a block closer to the centre of the campus than the other dorms and it has the tennis and beach volleyball courts right across it. Also the importance of each floor having its own laundry can never be underestimated. A few of this perks make life bearable at Calhoun. Being a student who requires absolute quiet and peace when I study, I definitely would have had a very hard time at Calhoun. If you are like me, than I would not recommend this hall to you. However if you are looking for a fun filled atmosphere and feel you need a place to chill and relax after your classes, and you would prefer that place to be your dorm room, than Calhoun is the place for you, because that is the place where it is at. Thank you sooo much for all the reviews, it really helps. I'm a freshman btw :)).